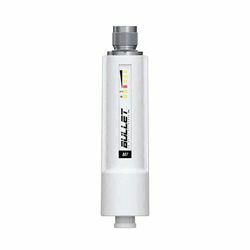 Integrating a powerful signal booster and a rugged airMAX 2.4GHz router, the Bullet M 2HP is designed for extreme long-distance wireless network bridging. Plug an Ethernet 10/100 network patch cable into the weather-proof housing, and then attach the Bullet M 2HP directly to an outdoor antenna... no antenna cables necessary. Use requires a 24V PoE injector (sold separately), a directional outdoor antenna with an "N" type female coupler, and a matching system in direct line of sight at the far end of the bridge. Performance depends on antennas used and environmental conditions. Operation may not be legal in all jurisdictions.